Our friends at Think Tank Photo just announced the release of two new product line extensions as well as a new “free gift” offer. The first are the Retrospective® 5 Leather, Retrospective® 7 Leather, and Retrospective® 30 Leather. These upscale, rugged shoulder bags maintain the Retrospective’s casual, form-fitting design. A new Dual Cross buckle on the front flap provides an extra measure of security. The new shoulder bags are designed to hold tablets and laptops in dedicated zipper pockets. The new Mirrorless® Mover 25i fits one medium to large mirrorless body, plus two to four lenses, an 8” tablet, and additional accessories. It features metal hardware, high quality fabrics, YKK® zippers and a magnetic closure. And, through the end of September, whenever you buy an eligible backpack from Think Tank you will receive Camera Support Straps V2.0 along with a Camera Strap V2.0 free! Think Tank offers a wide variety of innovative, high quality transportation and field photography backpacks. Order one and you will get to experience something really unique, which is having the weight of your camera shifted from your neck to your backpack harness system. With the Camera Support Strap V2. no more sore shoulders or neck aches! 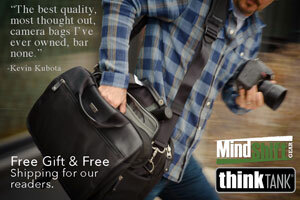 Vegans can still benefit from a slick new ThinkTank bag as well. This mirrorless mover is pretty cool.